I posted this on Instagram over the holidays. This is what I've chosen as my One Little Word for 2013. I enrolled in Ali Edwards' One Little Word 2012 class with the word "enjoy" but didn't get very far in the prompts before the year got overwhelming. This year, I chose not to enroll (but if you've never done this class, I urge you to try it out. Ali is incredibly prepared and provides awesome prompts each month, along with videos that will inspire you). I know I can't complete the prompts this year. But I am following Ali's plan of focusing on one word throughout the year. Last year, even though I didn't finish the class, I did focus on my word "enjoy" for most of the year. I tried to find something every day that I enjoyed and just relished in those moments. (Up until the holiday season when I became depressed and just wanted them to be over). This year, my word is "less." Less clutter. Less spending. Less weight. Less connectivity. Less stress. I want to maintain a clutter free (as much as you can with a toddler) house and craft space. I want to reduce our wasteful spending. I want to lose the rest of the weight I have to my goal. And I want to not be so connected to the online/social world. I want to take time with my son and answer emails later, not the second they pop up on my phone. I want to put down Twitter and Facebook and the internet for the hours when he needs my attention. When he deserves my attention. And I want to go into next holiday season without the stress, anxiety, and depression I've had the past two years. I'm going to focus on less projects, and just do the ones I truly care about (Project Life, Austin's baby album, making cards). 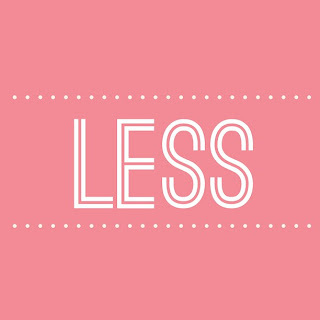 Thus, "less" has become my New Year's Resolution. Last year most of my resolutions flew right out the window. So this year, I'm not making specific ones. I'm going to focus on one goal. Less. Every new years, every one's resolution is always about MORE. I love that yours is about LESS. Just saying it makes me feel more relaxed. Less, Yes! Less was my word for last year, but I didn't take Ali's class. Doing it this year though. Nice! What's your word this year? That is my word for 2013 too. I blogged about it last night :) I haven't signed up for Ali's class yet but it is on my list to do this weekend. LESS is way better than more! I think I mentioned on instagram, but I love your word choice for this year. 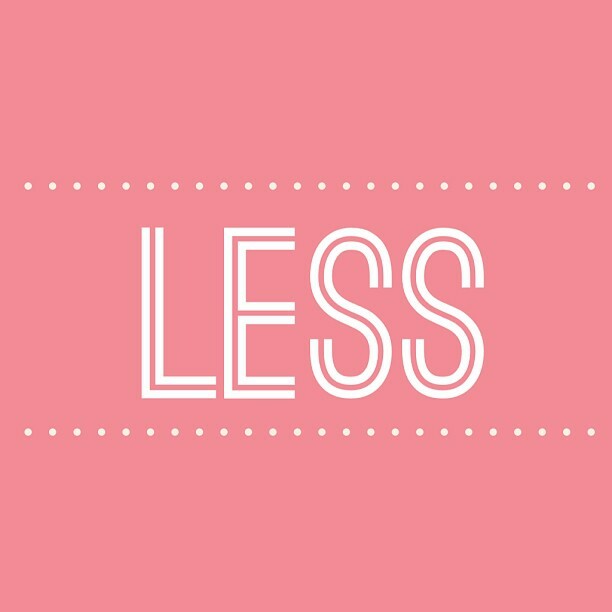 Less was not my word last year but I did focus on a lot of the same ideas: less stuff, less connectivity, less spending, etc. And I found/find it to be very rewarding. But I wanted to recommend a kindle book I really liked, it's a quick read and only $0.99! Check out Simple Ways to Be More with Less by Courtney Carver. Hi -just found your blog through Becky Higgins. It's great and thank you for all the freebies. Less was my word last year andi did do Ali's class up until the last few prompts. I plan to go back to complete it. This year I chose grace as my word. I'm not officially doing the class but will go over the materials on my own. I still have a lot of "less" that I'd like to get back to. All the best in your endevour! Oh yay! Thanks for stopping by. Less is such a great word, and so is Grace. Oh my gosh. Thank you! I've been mulling over 'confident' for a couple of days as I need to over come self-doubt, procrastination, worry, anxiety etc etc.. but less encompasses these perfectly and fits in with my decluttering, spending, wasting etc plans.. Less is now my word too. It's perfect!